It was 15 years ago this week the Maple Leafs and Montreal Canadiens took the ice at the Air Canada Centre for the first time. The game was the first NHL outing for the Buds away their spiritual home, Maple Leaf Gardens, where they had won 11 of their 13 Stanley Cups. How the Leafs wound up in a former mail sorting facility behind Union Station is a tale of basketball, buyouts, and, most importantly, big money. The tale starts in 1993 with the awarding of a lucrative NBA expansion franchise to Toronto businessman John Bitove. As owner of the as-yet unnamed Toronto team, one of Bitove's first challenges was to build an arena. The team had secured permission to play on the floor of the massive 29,000 capacity Skydome in during the 1995 season but after that the team planned to move to an arena at the southwest corner of Bay and Dundas, which was to be called Centre Court. It was a good thing too: Fans in the 500 level, those closest to the roof of the cavernous Skydome, complained they could barely see the action on the wooden court some 70 metres below. The $100 million Centre Court would seat 20,000 and have room for 150 corporate boxes, the team said. Meanwhile, the Toronto Maple Leafs were bursting at the seams on Carlton Street. Maple Leaf Gardens had provided the backdrop for the team's biggest successes but the relatively small number of seats, lack of corporate boxes, and the associated loss of potential revenue were becoming a source of internal friction. The two expansion teams that joined the National Hockey League in 2000, the Minnesota Wild and Columbus Blue Jackets, could both comfortably accommodate 2,000 more fans than the much-loved Leafs in newly built stadiums. The Gardens had been hastily thrown together in just over six months in 1931 and thousands of extra seats had been squeezed in over the decades, increasing capacity by a fifth but leaving little remaining space. As Mark Osbaldeston wrote in his book Unbuilt Toronto 2: More of the City That Might Have Been, a stadium that could accommodate the soon-to-be Raptors and the Leafs made financial sense but the Bay and Dundas site was too small to accommodate both sports. 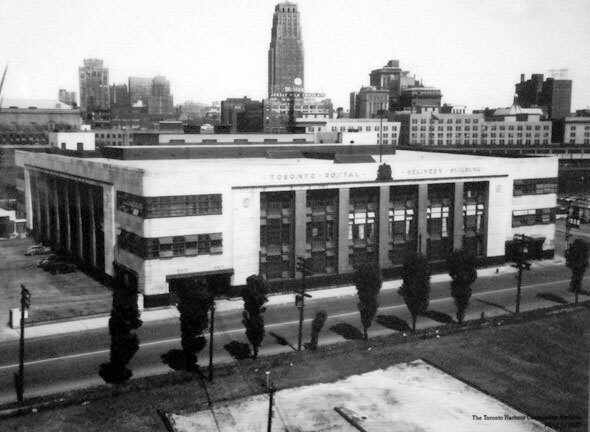 As a result, the Raptors bought the empty former Toronto central mail terminal, an old art deco building at Bay and Lake Shore. On the building's exquisite exterior, a series of 13 carvings by Louis Temporale Sr. depicted the history of communications in Canada. 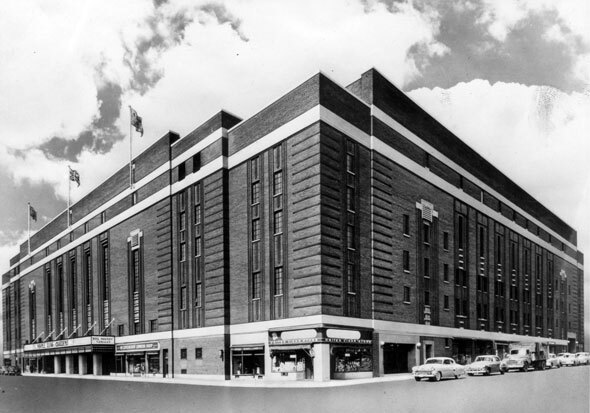 With the purchase of the historic building - one of the first in the city to incorporate international style features - and a small patch of former railway lands, the Air Canada Centre was conceived. Canada's national carrier purchased the naming rights to the stadium for $30 million in 1995 and the Raptors planned to break ground on the project in November 1996, but a change of ownership would put paid to that. Founder and president John Bitove was forced to sell his stake in the team to fellow shareholder Allan Slaight in a surprise "shotgun" agreement, giving Slaight 79% ownership. The newly empowered Slaight was in talks with construction tycoon and Leafs shareholder Larry Tanenbaum about the possibility of a stadium sharing agreement. Slaight didn't see any major obstacles "as long as everybody [kept] an open mind." The Leafs, meanwhile, were still trying hard to lure the Raptors away from the ACC, which the team believed would be too small for NHL hockey. The Buds were eyeing the possibility of new stadiums at the Exhibition grounds, near the Skydome, Varsity Stadium, and at Downsview. Then the team did something few people saw coming. 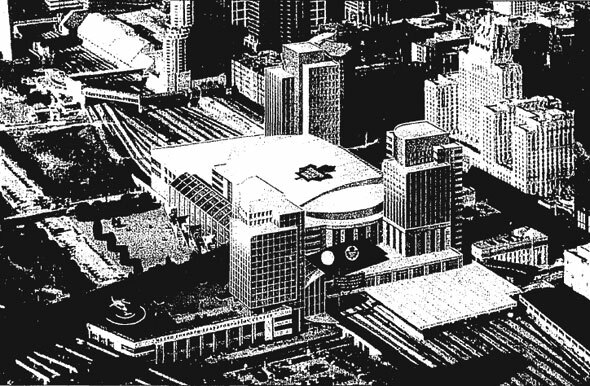 On April 17, 1997 the Leafs revealed plans to build an entirely new hockey arena a stone's throw from the Air Canada Centre, directly above the tracks of Union Station. The stadium would share the grand entrance of Toronto's railway terminal on Front Street and include a tower similar in design to one planned for the ACC. Most importantly, the proposal did not foresee the Raptors as neighbours. Under the Leafs' plans, the postal station would be turned into a bus terminal and the basketball franchise moved under the same roof as the hockey team - too bad if the Raptors were already $80 million in the hole for the ACC and were obliged to be ready for the start of the 1999 NBA season. As Osbaldeston wrote, the trouble was the Leafs didn't actually own the property the team planned to build on (and over.) Union Station was on land owned by the city and leased to the Canadian Pacific Railway and Canadian National Railway. The two rail companies were locked in a dispute with the city over millions in unpaid rent. 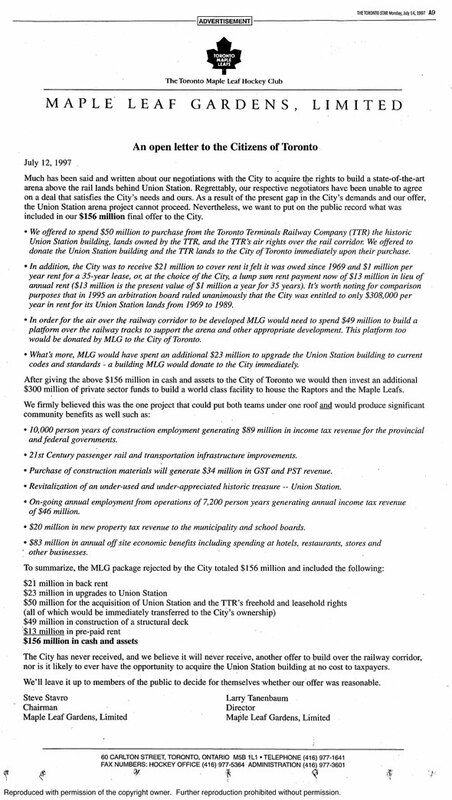 The Leafs offered to cover CPR and CNR's costs and pay an additional $50 million on top for the land rights. There were additional sweeteners, too. The Leafs balked at a counter offer from the city that would have cost the team significantly more. In a last ditch effort to reverse its fortunes, full-page ads were printed in Toronto newspapers appealing for public support. It wasn't to be, however, and the team turned its focus once again to a stadium at the Exhibition grounds that appeared to have the support of city. 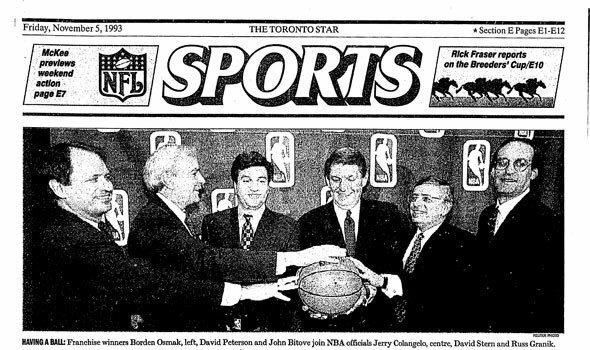 In early 1998, the Leafs deked in a new direction entirely and bought the Raptors and their unfinished Bay Street arena wholesale. The team initially clung to the idea of a grand entrance through Union Station on Front Street but eventually dropped that idea too. The Air Canada Centre opened in 1999 with both the Raptors and Leafs best friends.